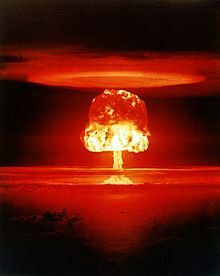 Nuclear weapon test Romeo at atoll Bikini. Nuclear engineering is a field of engineering dealing with application of atomic nuclei breakdown and other sub-atomic physics, based on the principles of nuclear physics. It includes the interaction and maintenance of nuclear fission systems and components such as nuclear reactors, nuclear power plants, and nuclear weapons. Nuclear engineering also includes the study of nuclear fusion, medical and other applications of radiation, radiation safety, heat transport, nuclear fuel and other related technologies, nuclear proliferation, and the effect of radioactive waste or radioactivity on the environment.